When my friend Maya told me she wanted a tattoo, I prayed she meant permanent eyebrows. I personally dislike the look of tattoos and think they should be outlawed along with body piercing and high waist jeans. The problem with tattoos is that once people do it there’s no stopping them—it’s sort of like losing your virginity. Despite my misgivings, I told Maya I’d go with her to get a tattoo and there were two good reasons why. One, she was my friend and I felt it was important to support her in this milestone event. Two, I heard they gave out free candy. 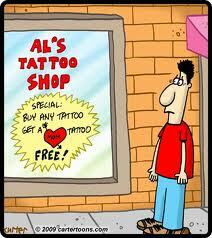 Given that this was my first visit to a tattoo parlor, I spent hours debating what to wear. I settled on a pleated wool skirt, cashmere sweater and pearls. Granted, it wasn’t a tough look, but the only black leather I owned was a holy bible from the Holiday Inn. Instead, I acquired some edginess by studying up on ghetto vernacular so I wouldn’t sound out of place. We drove to Starbright Tattoo studio on a Friday afternoon. I tried to make conversation to help put Maya at ease. “So, did you hear about the Caucasian guy who thought he got the Chinese symbol for courage tattooed on his bicep, and it turned out to mean ‘chicken?’” I asked. “Look, I’m not changing my mind. I’ve wanted to do this for a long time. My tattoo’s going to look just like this,” she said, placing her hand proudly on her chest. “I meant the tree of life,” she said holding up a charm dangling from her neck, a simple trunk with lots of swirly branches. “And, two stars above the tree will represent each of my kids. It will go right here,” she added, pointing just below her navel. We turned off the busy highway and into the parking lot. We both took a deep breath and opened the glass door. “My home girl’s here for a tat,” I announced. “Hello ladies. Gordo will be with you in a moment,” said a gentleman with a silver hoop the size of a coconut protruding from his nostrils. Maya consulted with Gordo while I chatted it up with nose ring guy. “Oooh, Snickers bars! This is dope, man, “ I said, reaching into the dragon-skeleton candy bowl. “What a relief!” I said, and hugged her. I could relate. There are certain things in life that no one should ever be subjected to witnessing: like tattoos, childbirth, and nursing home residents eating Jell-O. Minutes later she was face down on the table, barebacked and swabbed. Black ink spilled from her back as Gordo skillfully maneuvered the tattoo gun across her virgin skin. Maya grimaced every time the needle edged near her spine. I took video footage but it was hard to hold the camera and eat snickers bars at the same time. Within thirty minutes Maya had been deflowered and grown a tree. She looked behind her in the mirror and admired her new work of body art. Then she thanked Gordo and paid as casually as if she had just bought a roll of postage stamps. “Take care ladies,” Gordo said as we walked out the door. “Peace out dog,” I yelled back. “The tramp stamp?” I asked. “…nursing home residents eating Jell-O.” I am dying here. That is too funny. I know what you mean about a tramp stamp. In my single days I’d be all back there and junk and I’d look down and read Bob, only my name was Ron. Catch you on the flipside, Holmes. Ha! 🙂 The closeset thing I have to that is the phone number of my local chinese take-out restaurant hand-written on my palm! Hi Lisa, As always, I have sooo m uch fun reading your blog….you have such a great sense of humor and I look forward to when it shows up on my computer. Jeanie–Your kind words are inspiring! Hope to see you on my next visit! This had me laughing out loud! I love your choice of ensemble to wear to a tattoo parlor. Way to blend in with the other peeps. If I ever decide to get a tatoo, I’ll be calling you to accompany me since you’ve got the lingo down. I’ll be there for you, Paprika . . .
Soooo, when do you need a driver, dear????? Me? How about I’m designated driver for you–I’d like to see a rendition of your college mascot on your . . . hmmm . . . The only ink I’ll ever be involved with is in my pen. Kudos to you for playing the role of wingwoman on this sordid adventure in human etching. I hope you got some great shots of the Snickers bars. I really do believe a “law” should exist not allowing a tattoo without “an intelligent second opinion” present, ya gotta wonder what some people were thinking ! Agreed. And, a “Don’t drink and tattoo” law. I have no idea why people VOLUNTARILY go anywhere near needles. *shudder* no wonder they give out candy. I literally laughed out loud at that. What street cred you have! I work hard at the swagger . . . I sighed when my oldest son got his first tat, but it was nowhere near my reaction as when my 70-year-old mother got hers. I am the beacon of sanity in my family, and that’s not saying a lot. Great blog–pleased to be a new subscriber! Unbelievable! That must be quite a story. Thanks so much for commenting, and for subscribing! Looking forward to hearing more from you.